How to register in Smart SurfMax 50? Enjoy the all-day internet surfing, valid for 1 day. How to register in Smart SurfMax 299? Enjoy the all-day internet surfing, valid for 7 days. How to register in Smart SurfMax 995? Enjoy the all-day internet surfing, valid for 30 days. How to register in Smart SurfMax Plus 50? Enjoy the all-day internet surfing, valid for 1 day.How to register in Smart SurfMax Plus 299? 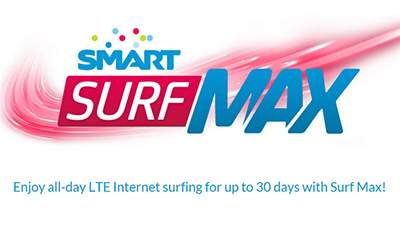 Enjoy the all-day internet surfing, valid for 7 days.How to register in Smart SurfMax Plus 995? Surfmax offers 2G, 3G or 4G, where available. Keep posted with the latest promos about your mobile network by visiting www.smart.com.ph. To learn more how to manage your data usage and Smart’s newest offers, don’t forget to log on to www.unlipromo.com or visit Unlipromo Official Facebook Page for more mobile data offers. Hi, what’s the difference btwin supermax & plus?